The dazzling Green-cheeked Amazon (Amazona viridigenalis Cassin, 1853) belongs to the order of the Psittaciforms (Psittaciformes), to the family Psittacids (Psittacidae) and to the genus Amazon (Amazona). The name of the genus comes from the name of the species Psittacus amazonicus given by Linnaeus in 1766 to a specimen collected in the basin of the Amazon River. The name of the species “viridigenalis” comes from the Latin “viridis” = green and from “gena” = cheek. It is, therefore, a parrot coming from Amazonia and having green cheeks. 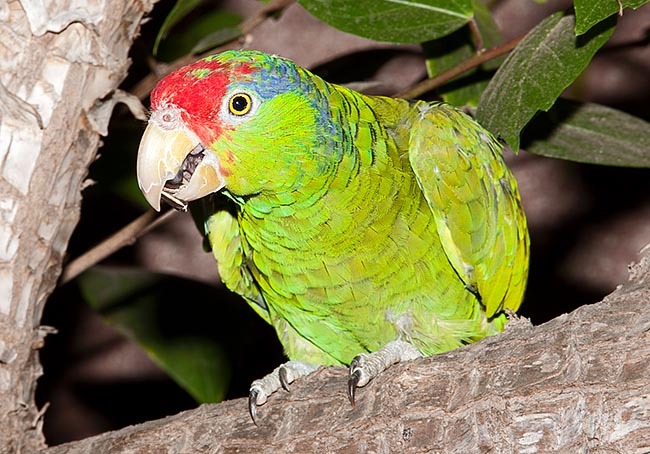 The Amazona viridigenalis, by locals called “curica” or “iurucù”, lives only in north-western Mexico, from south of Nuevo Leon up to Tamaulipas and from east of San Luis Potosì to north of Veracruz. It can be found at an altitude of 1000 metres above the sea level in the low pluvial forest, in the subtropical forests, close to the water streams, with trees of Quercus and Pinus, at the border of impenetrable forests and in open spaces, in lowlands with cultivated lands. Thus, it is a bird easily adapting to various habitats. Even if almost all the amazons have the green cheeks, here the colour is by sure very intense and emphasized by the fact that the feathers are not black-rimmed. Furthermore, the blue stripe starting from the eye and embracing the cheek extending along the neck, has a clear cut of colour between the blue and the green. An intense red stripe covers the front and the beak is of horn colour. The close morphological proximity with the Red-lored Amazon (Amazona autumnalis), has led the taxonomical biologists to classify both species as a superspecies. 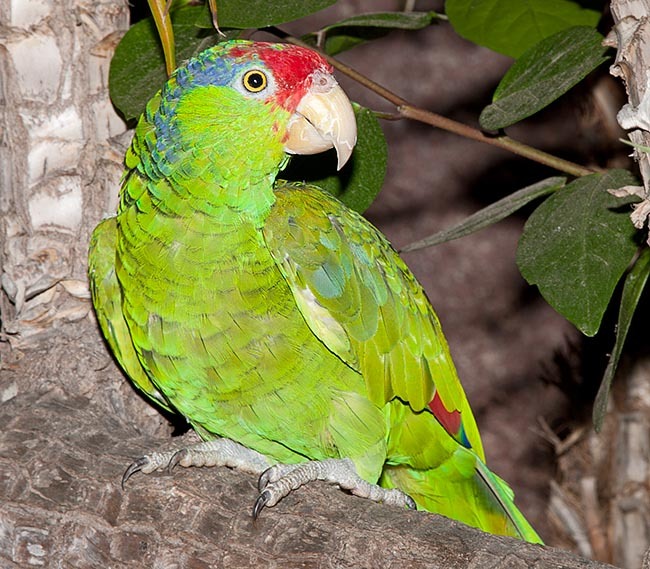 A next of kin of the Green-cheeked Amazon is also the Amazona finschi. 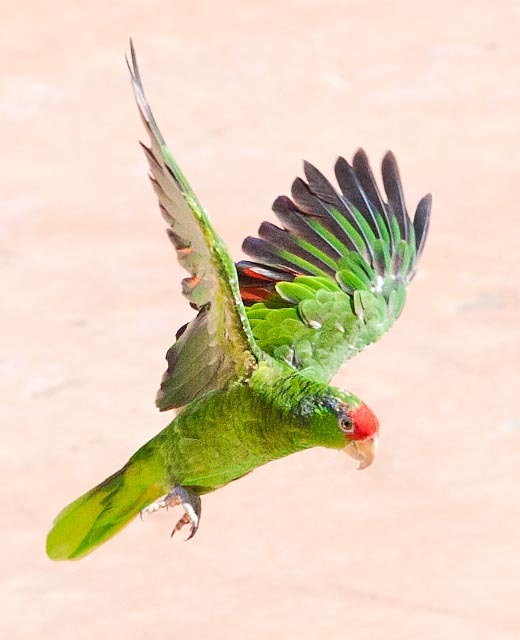 Actually, the distribution areas of the two species are adjacent, in theory they may be confused, but the observant eye will notice differences: the Amazona viridigenalis has, in fact, a greener colour and the occipital red is brighter and extended towards the nape. The Green-cheeked Amazon reaches the height of 33 cm with a weight of 325-350 g. The wingspan is of 194-213 mm, the tail measures 97-116 mm, the beak 24-31 mm and the tarsus 22-25 mm. Since the birth, the chicks resemble the parents, apart from the eye, clearly brown. In most of the cases, the body structure of the males is more robust, broad head and powerful chest than the female. During the first year of life, the iris becomes intense yellow in the males and pale yellow in the females. There is only one lutino variant and there are no described subspecies. Reproduction period apart, these birds fly in crowded flocks of 20-100 individuals. In the early morning and in the evening they are rather boisterous, and even if they are hidden by the vegetation it is therefore easy to locate them due to their vocal emissions. The voice has a vast repertoire, which expresses in harsh trills such as “wee-ee-eee-eeet” gradually increasing in tone. It includes squeaky “keekoark keekorak” or “chikak chikak oorak oorak”, united with metallic variations “kalink kalink” ending in a “ow-er”. It makes noise, also, with some “rrik” and in quiet conditions emits some short “chek chek”. The voice includes shrilly calls while swooping down from the tall pine trees of the type “clee-u crach crach chrach” and shrieks “kee-yaw graw graw” and “cra cra cra” when frightened, not to talk about unpleasant talked “ji ji ji ji”. They often go around looking for food along with the Amazona autumnalis and the Amazona oratrix. They nourish of seeds of Pinus, berries of Ehretia, beans of Pithecellobium and berries of Melia azedarach. Some include in their diet also buds and fruits of Juglans, Liquidambar, Eucalyptus and Chorisia. Finally, they go raiding the corn fields, thus creating more than a few problems to the agriculture. In Mexico, the hatching time begins in April, even if, at times, some wait only till March. Frequently, they utilize cavities in the tall pine trees already used by the woodpeckers, at heights varying from 10 m upwards. It happens frequently that their nests are gotten inside the trees of Taxodium mucronatum, Bumelia laetivirens and Brosimum alicastrum. They spawn two to four eggs which they hatch for 28 days. The young leave the nest after about eight weeks and remain with their parents for other six weeks, before getting autonomous. The chicks are similar to the adults with brown eyes, paler shades and lesser extent of the red-blue. Only by the third fourth year they begin to assume a colouration which confounds them with the adults. In the origin locations the green-cheeked Amazon is fairly diffused, even if during the last decade a certain decline has been noted and its distribution area has greatly reduced due to the reduction of the places suitable for the nidification, connected with the deforestation and, generally, with the human activities. It is an animal with a medium extinction risk included in the appendix A of the International Convention.